It is officially the last minute. Christmas Eve is tomorrow and if you are in need of a cookie/candy/dessert recipe, then you can thank your lucky stars because it is right here! 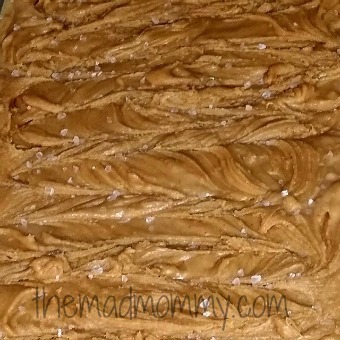 My Peanut Butter Maple Fudge with Sea Salt is delicious and possibly, the easiest fudge recipe ever. 4 ingredients and 5 minutes are all you need. Put all of the ingredients, except the seas salt, in a microwave safe bowl. Line a baking pan with foil or wax paper and lightly spray it with cooking spray. Microwave the ingredients in 30 second intervals until it is warm enough to be mixed smooth. Once it is mixed, (move quick, it sets fast) pour it into the baking dish and the spread it as evenly as you can. Sprinkle the top lightly with sea salt and then, you wait. You only have to wait about an hour. This fudge recipe sets up super fast. Once it is set, cut it into squares, serve up and enjoy! Have you ever made fudge? I Married a Man with Kids and I am NOT a Parent! I adore peanut butter! This is such a yummy treat! You had me at peanut butter. Seriously, though, I love pretty much any kind of fudge. It is one of my favorite sweets. My hubby and I always make a family fudge recipe.. I had plans to share it on my blog, but then.. well, life happened. So I will have to give your fudge a try instead, heehee..
Life does happen, hahaha! To me as well. I have so many recipes that I haven’t put up because, well, life happens. This one is a winner though! You make the best and easiest desserts Echo! My daughter is a peanut butter junkie and I know she will love this! What are you talking about?! My desserts are just easy, your desserts have me drooling for DAYS! Hahaha, Any peanut butter lover will adore this! My husband doesn’t like chocolate, so this is the fudge I make him! I’ve only made fudge once and it went well! It didn’t look as good as this, though. I already saw and pinned this before I even got here to comment. So it’s making the rounds! Yay! It makes me happy that people are pinning it! Fudge is easy to make a darn tasty! I’m sure yours looked delicious too! OH! I love fudge, and I haven’t tried this flavor before. Thanks for such a wonderful and easy recipe! I’m so glad that you shared it at Together on Tuesdays, too 🙂 Happy Holidays! It is such a wonderful flavor combination! Ooooh, that dash of sea salt just put me over the edge! I love fudge and Christmas is the only time I make it. I may have to make yours in addition to my granny’s fudge. Thanks for sharing… and Merry Christmas! This is a quick version! I saw you making old fashioned fudge and I am very jealous! You will love it! The sweet and salty is so wonderful! Oh my, you had me at sea salt! I love it and it seems that a lot of cookies, fugde and choloate bars contain sea salt lately. I’ll have to try and make these! Sweet and salty is my FAVORITE dessert combination! YUM! I’m over baking but totally pinning and stumbling this for next year! MERRY CHRISTMAS friend! Awesome! It is such an easy recipe! Oh my gosh, YUM! I needed one more dessert item to make for Christmas….this might be it! The best thing about this one is it is so quick and easy! My son loves both peanut butter and fudge. Surely, this momma can make this simple recipe and get a few hugs out of it! Oh, you will get wonderful hugs from this! I love super easy to make treats like this! The fewer ingredients, the better for me. I’ll have to give this a try soon! This one is so easy, April! You’ll love it. Just from looking at those delicious pictures I know I really shouldn’t read this… ohh no too late and me with every one of those ingredients sitting in my cabinet except the peanut butter chips. Oh well what are the holidays for if not to gave 5 pounds 🙂 Off to Walmart for some pb chips. This looks SOO GOOD! This is what I think I will make for the inlaws house! It is so delicious and totally, totally worth it, Becka! Oh my goodness! That looks amazingly delicious!! I haven’t made fudge yet, maybe because I didn’t want to make the usual chocolate, and when I saw yours was PB maple, I think I found the perfect recipe to make!! Merry Christmas!! It is a unique combination that your guests will love! I’ve never made fudge before, but I love it. Its on my list of goals for the next Christmas season. This is a super easy fudge to start with! too bad. we don’t have oven. i like recipes that are easy to made. This one is made in the microwave, but you can also melt them stove top in a double boiler! Oh wow does that look great!! We could make it allergy friendly at my house by using sunbutter! I can’t want to make this ! YUM! It would be just as delicious with sunbutter! I just shared this with a friend for tomorrow’s dessert party. We have nut allergies in my household, but I am sure that others will enjoy devouring this dish. Yes, they will love it and they will thank you for sharing it! Peanut Butter (plus it’s Reese’s) and Condense milk makes this one such a sweet combination. I’m sure to love this one. Very interesting. I never really had or tried this one before. I bet it would be a good one to give a go later. It is a great one to give a go! This got pinned immediately! Looks and sounds amazing. Can’t wait to try it. Yay! It is so delicious! I bet you will love it! This recipe sounds absolutely delicious. 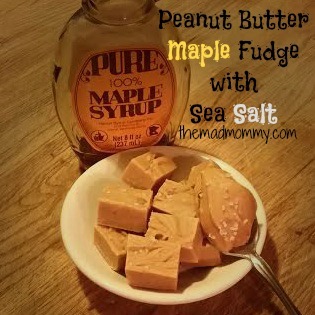 Peanut butter and maple are my fiancee’s favorite flavors, I should try out this recipe for him! He will definitely love it for sure! Nope, I’ve actually never made it myself and now I can’t even believe that. I need to do it and start with yours! This is an amazingly easy recipe to start with! My husband loves peanut butter fudge so I bet he would like this. I had like five pieces of my grandmothers maple candy yesterday and I really want some of yours now that I saw your picture. It is so delicious! A great balance of flavors! This looks so good but I must admit, I have none of the ingredients in my pantry. I have a daughter that loves fudge and I think I am going to show her this recipe just so she can learn how to make it. Great recipe. Thanks. She will love it because it is so easy! This sounds delicious, the maple/peanut butter combo is making me hungry! I just bought a bunch of 50% off Xmas peanut butter cups too, this is fate!! !